and sources of inspiration. I hope you enjoy! My first post features a place that continuously inspires me and has for the past 30 years: Capri, Italy. Arriving by boat to Capri truly takes your breath away with its crystal blue waters and dramatic cliffs dotted with bright white villas. On the island, you are greeted by friendly locals, the smells of jasmine and lemon, and hot pink bougainvillea-covered storefronts. Such a captivating setting and beautiful ease to entertaining and enjoying everyday life are all too tempting to make your own, and as a result I have brought many of these elements into my own home and designs. 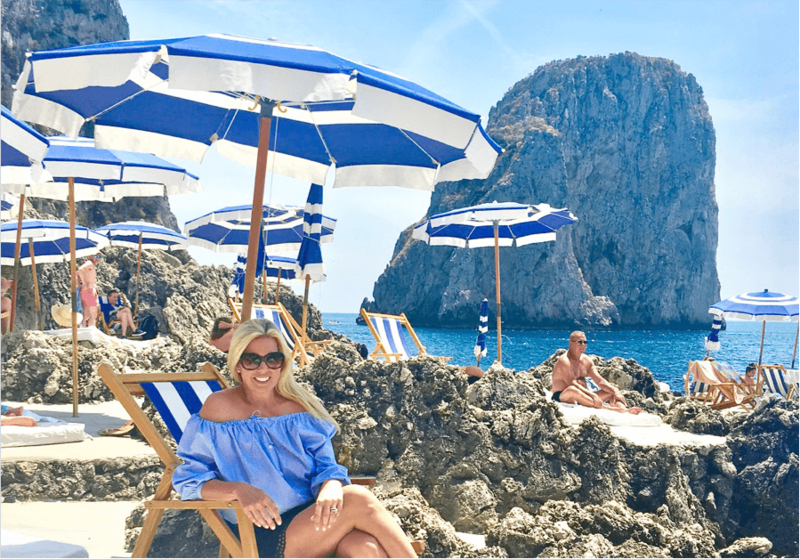 Capri’s relaxed flair and beach setting make it easy to pack for the island: A suitcase filled with lots of blue and white, kaftans, and sundresses is all you need, and it’s always smart to pick up a new pair of espadrilles or sandals crafted by local artisans – perfect for walking the many cobblestone streets. For shopping or the beach, a straw tote is the perfect accessory. MDS Stripes – Beautiful tops and dresses can take you from lunch on the beach to dinner in town. Pippa Holt Kaftans – Easy and comfortable kaftans perfect for exploring the island. Christophe Sauvat – Chic and fun local bags. 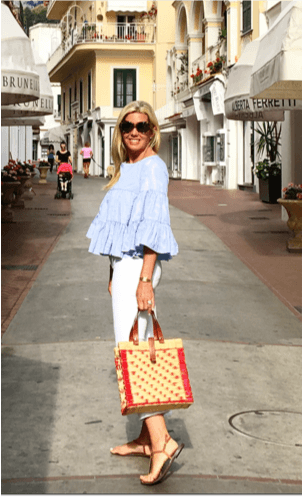 Amanda Lindroth – Great straw bags available in the U.S. to complete your island look. Canfora – offers an iconic and timeless style with sandals crafted in Capri since 1946. Stateside, Soludos is a great source for espadrilles. I personally love those in stripes or with a lemon motif. Capri prides itself on meals to enjoy, particularly through its great food and beautiful table settings. Gorgeous table linens and baskets filled with fruit, bread, or pastries beckon you to dine, while pretty colored glasses and decorative ceramics add the perfect accents. The casual ambiance and formal place settings combine to form an understated elegance that finds itself at home both by the pool and in the finest restaurants on the island. Bamboo growing naturally in Capri has provided inspiration for my own designs, with bamboo silverware emphasizing a casual ease to an otherwise formal place setting. 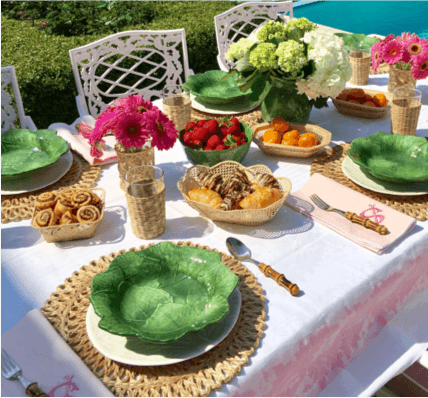 Cabana Capri – One of my favorite shops on the island is Cabana Capri, founded by Helen White, that features resort-inspired global luxe from tableware and home objects to kaftans and cashmere. A walk down the Via Roma gives you a taste of fine local craftsmanship, such as The Sea Gull Capri for a fabulous collection of ceramics or Capri Masterpiece for incredible colored glassware. 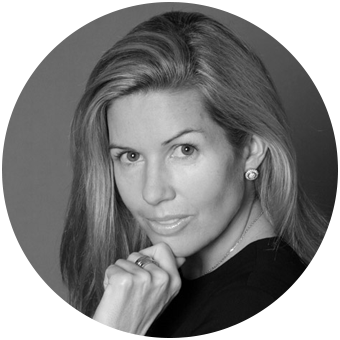 Stateside, Artemeste does a great job of curating interesting and unique pieces from Italian sources, while Amanda Lindroth and Aerin Lauder never disappoint with their always beautiful baskets and tabletop items. You would be hard-pressed to find a bad meal on Capri; the abundance of locally-sourced and natural ingredients and time-honored recipes make each meal perfection. 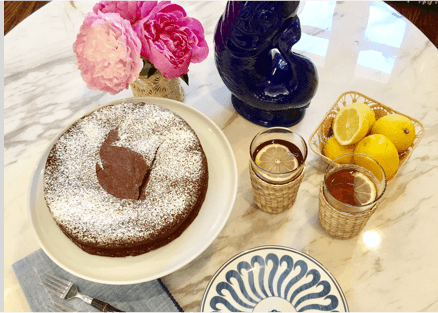 As someone who adores chocolate, unconventional inclusions, such as chocolate cake for breakfast, are a welcome addition to the traditional Italian staples. If you’re lucky, your hotel may even treat you to one of these flour-less chocolate almond cakes upon arrival (thank you, Hotel Quisisana)! Preheat oven to 310°F and line the bottom of a 9” spring form pan with parchment paper. Slowly melt the chocolate and butter over a double-boiler. In a stand mixer with a whisk attachment, whisk together the melted chocolate mixture, the cocoa powder, almond extract and sugar until combined. Add the ground almonds and whisk until combined. Add the eggs one at a time, adding each egg after the first has been incorporated into the mixture. Pour the mixture into the spring form pan. Make sure the mixture is level and smooth on top. Bake for about 50 minutes. The cake will rise a bit and then fall back on itself once it cool. The baking time varies slightly depending on your oven, but the cake should be very moist in the center and dense once it cools. Cool before serving, and dust the top with powdered sugar. Buon Appetito! I recommend reading this great post from Kathy’s Culinary Adventures. 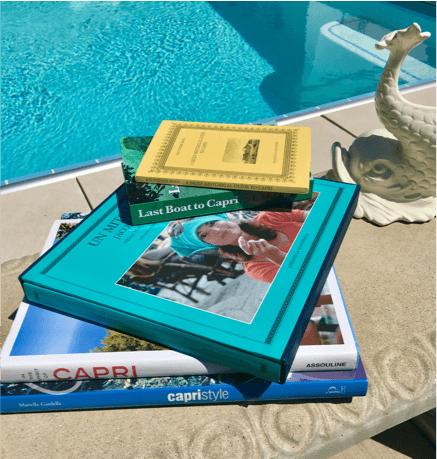 There are many books I love featuring Capri, from style books, to fiction novels, to the rich history of this getaway for Roman emperors – all of which can be found in La Libraria Conchiglia bookstore just a few blocks from La Piazzetta.